I'm pretty sure everyone here has some idea of what Hero Lab is and how to use it. 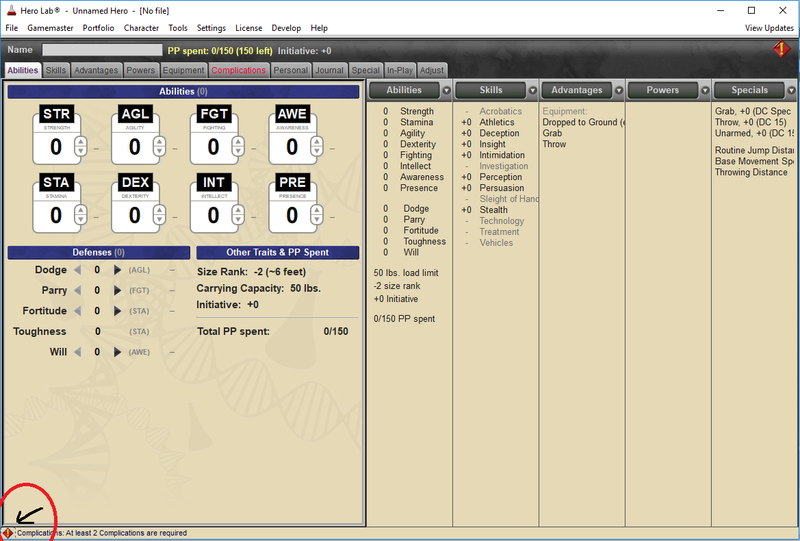 It's one of the most available and helpful bits of software when it comes to building out characters for MnM and comes with an free indefinite demo (though purchase is required to Save and create custom options). As such most people I know who play MnM, or even just build characters without playing, tend to use and recommend it over the other options out there like the Excel Sheets or other options. This thread is meant to be a place to consolidate any bits of trivia or helpful useful information on how to use the program. While the general way it's used is intuitive there's still a bunch of minor parts of it that are not and little ways to improve your efficiency or "life hacks" to get cute little extras you never knew you had access to. And of course the Editor, the least intuitive but most versatile tool a user has access to, which allows one to insert their own houserules, custom powers, and create easy custom templates. I'll try to keep an index of these things to make things easier. Common Houserules and togglible options - Starting right from the beginning, when you first create a character it gives you a bunch of options right from the start, PL, startting PP, Allegiance, Construct or Being, and the Character/player names. But off to the side there's a list of check boxes most will just skip over, it appears to just contain the option to turn on and off access to the various DLC for the system (Power Profiles, Gadgets Guide, and the free Hero High and cosmic options) but if you scroll down it contains a lot more. First is the Gamemasters Guide Options for things like Reputation, Fighting Stances, Unlimitted PP/PL, and knockback. You can decrease Skill cost down to 5 per pp. Little quality of life things like if it will prefix a power with it's modifiers, hide the default effect name, or allow unlimited access to the Library tab where you can post "free" powers which are there for keeping track of possible Power Stunts or Inventions. It's easy to miss but can have some very useful options. If you alter any of the options it alters the screen to allow you to set these changes as your new default if you want or return to default later. Validation Reports - The Validation report is very useful, for Old and New players, it keeps track of things that break the rules of the game. Going over PL/PP limits, Forgetting to write in the information for a Limit, Not putting in the statuses for an Affliction, or selecting 2 options in an array to be active at once. You can of course turn these warnings off if you want or need to but it's usually better to leave them on to make sure you don't accidentally miss something important. There's an option at the bottom of the screen with a button you can press to show the information for all heroes in a profile. You can select each individually to see if there's any reports about them, invalid heroes will appear with their name in red. Advantages and Languages - There's a few options here that can make things easier during character creation. In the search bar you can can not only specify words or phrases to find an advantage faster but also filter it by type, such as fortune or Skill or if it's ranked by searching by that word. You're language is always set to Native Language but you can specify which one that is, and adding languages is an option bellow the Advantage section rather than an advantage of it's own. There is an option to create custom advantages right at the top, letting you fill in any information you need though these are not remembered for later characters (the editor is needed to create universal custom advantages). Powers - Quite a few things are here given how much the system is focused on Effects. 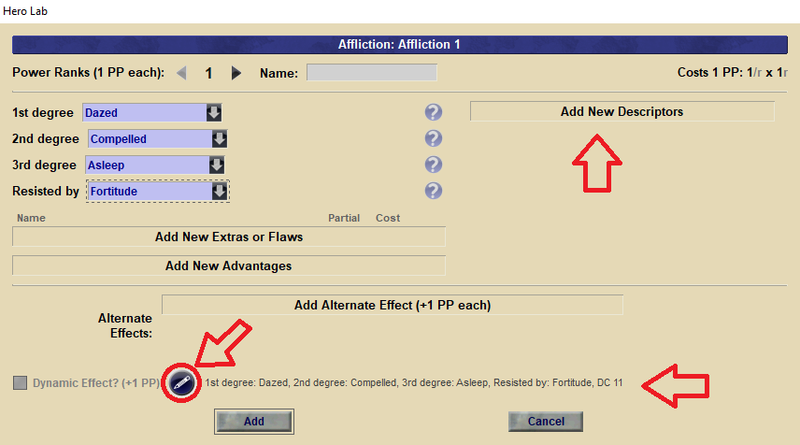 For those who have Power Profiles or Gadgets Guide, or simply just want a clean list of effects you can select an option to filter out pre-created powers and only show effect options. When you select an array there is an option to turn it into a Device as a drop down option in the Array window, this helps reduce stacking and make a sheet look more streamlined. Defense and Strength Effects have a couple unique qualities, there's a system issue that has not been corrected where these Power Options don't have the ability to take on Flaws for some reason (I have reported it but they never changed it), They can also be used to create AEs off a defense or your strength ranks by simply selecting the AE option of a blank Strength/Defense effect and will allow you to AE with a PP cost up to ranks of the substituted stat (so Strength 5 gives only 5pp to AE off of instead of 10pp which is the total cost of Strength). Selecting Multiple Effects as a power option disables the Array Power Option but not AE options on the individual effects themselves so you can still create arrays inside these though it becomes slightly more tedious to keep track of both during creation and later play as you add PP. Power Information- There's a few small quality of life improvements that the system has that may be easy to miss or overlook. One is the Descriptor Tab, it allows you to add common or custom descriptors to the power such as Electric, Divine, Shadow, Etc. There's no mechanical benefit but it helps in keeping track of or displaying information that may not be obvious to readers. There's also a small button near the Okay and Cancel options that allows you to add custom notes to pin on a power, this lets you explain certain aspects of a power such as alternative interpretations of how it's effect would work or details on it's in-setting limitations or mechanics, but anything can be put in here. Lastly is a little line of information that displays a summarized line of what the power is doing including the DC to resist it for attacks. Journal - A small tab that can be forgotten by some. It lets you keep track of progress and add PP or PL in an ongoing campaign. While some may question the need for it when you can just add more on the character creation screen it is useful for keeping track of how the character progressed over time and why, a handy achievement tracker. Adjust Tab - the final tab is the Adjustments tab, this allows the character to place and keep track of status effects like being Dazed or in-play stat alterations (such as being weakened or hit with a growth ray). A small life-hack is that you can use this tab as an easy way to refresh your knowledge of what certain statuses do for newbies. The "?" buttons near the status effects will display what each one do, making it easy to look up without having to open the SRD or GM books in the event you forget the specifics of what it does and need to look it up. Encounter Builder - One of the most useful options for Build focused users as well as GMs who don't want to create hundreds of unique characters from scratch for every setting. 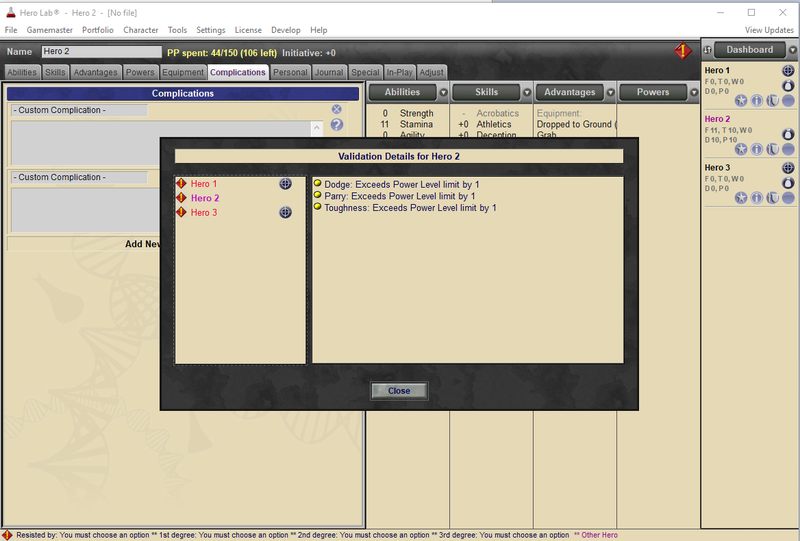 The encounter builder is a way to import a bunch of the free pre-made characters the system comes with into a profile. This can be used for it's intended purpose of letting you import mooks or random villain encounters but for Builders it's a good way to look at various custom characters to get ideas from or simply use as a template to create a new character. 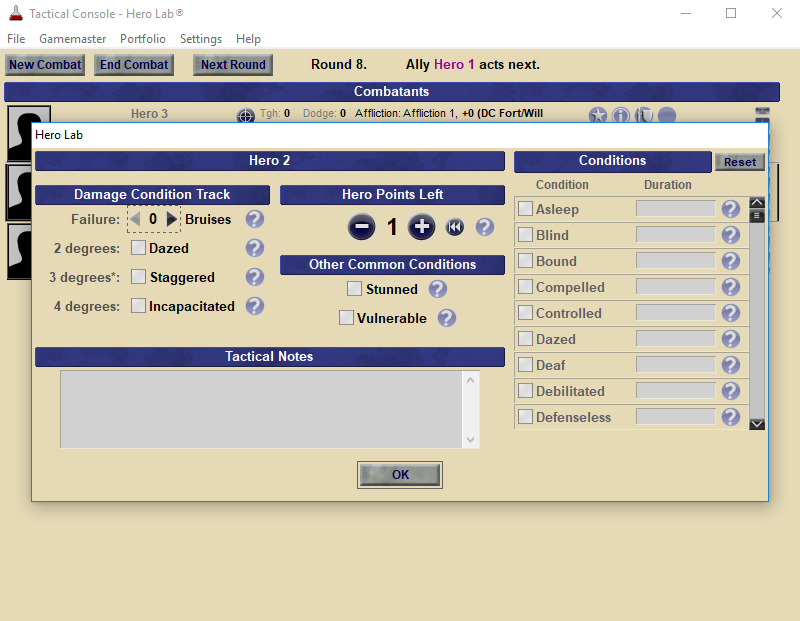 Tactical Console - The only other usable option, it allows a GM to run encounters through Hero lab. 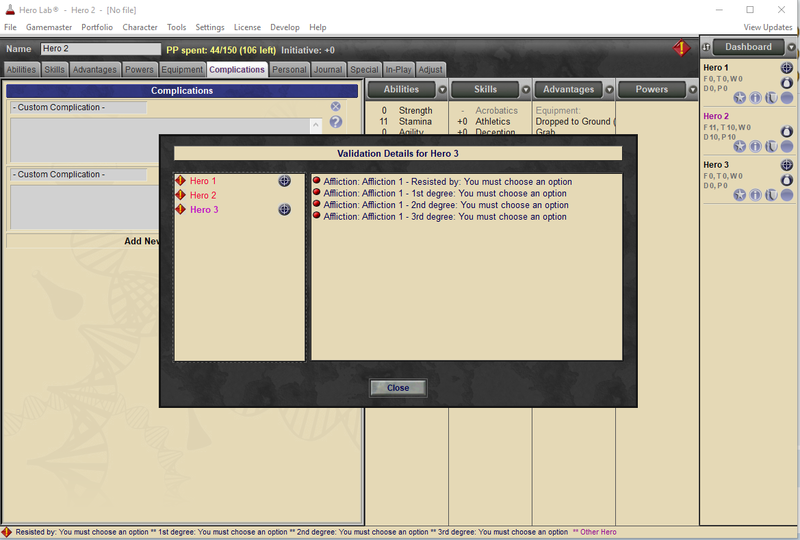 It has a setting option to re-roll initiative each round. The Play Button for each character advances their turn, it's pressed once the character has finished all their actions for the round. The Pause button is for characters who delay their actions to a later point in the round. The Sword is for Readied Actions, I'm unsure why these were separated into different options.The little crosshair button takes you to a character's page in the profile. The button that looks like an Eye brings up a small window allowing the GM to make ingame adjustments quickly. Lastly there's a button to reroll initiative for a character and another to remove them from combat such as if they flee or are incapacitated. Portfolio - This option has a few useful tools. In addition to containing the option to create a new character to add to a portfolio it allows you to import or export characters between save files, duplicate characters, and delete characters. Tools - This contains the options for 2 important things. The Dice roller and possibly more importantly the Editor. The Editor will open a separate window in Hero Lab where you can open or create a new save file for custom changes you want to make. So you can keep your various house rules separate, so one setting can have access to certain rules and not others. Since these are separate from game files it means that you won't damage the system itself by making changes as you an always delete these customizations. It's probably the most unituitive and hard to learn part of hero lab, and while I have made some progress in learning it I am not all that knowledgeable in how it works. Perhaps the easiest way to use it is to create custom advantages which often require little more than writing out text, and most of it's options can simply be copied by using another advantage as the base. I'm not sure if there's any guides or downloads of custom sets for this but if anyone can provide them that would be great. I'll try to add some more substantive feedback later tonight, but another useful thing, albeit somewhat counter-intuitive given how easy it is to adjust things on the fly, is that for characters with "stages" they tend to be in, like someone with Growth, It's often a good idea to build the initial character sheet, duplicate it a few times, and then set them for the major stages. That way, you've got an immediate reference for those discrete points. Similarly, for characters with Metamorph, or an Alternate Form where they won't always be in it, I've found it's just easy to print more than one character sheet. I think I built something in the editor that fixes the inability to add Flaws to the Defense and Strength effects. I'll have to look back into that when I have more time. 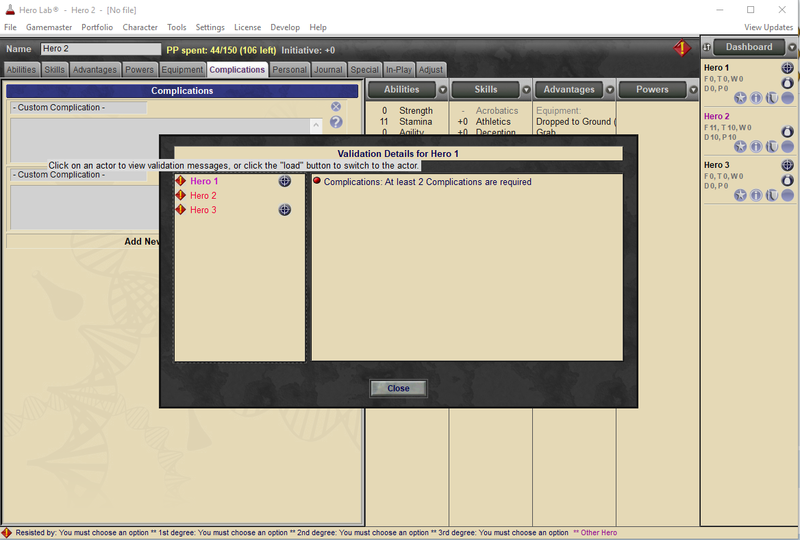 As a side note, for anyone interested in doing more advanced things with the editor, I highly recommend downloading the Authoring Kit and running through the tutorial to create Savage Worlds. It will greatly enhance your understanding of how things fit together although, unfortunately, it also underscores just how many things you can't edit on an officially released system. Sorry I haven't come up with anything else, but the forbidding of Flaws on Defense and Strength Effects is due a Tag. To fix it, you have to make a copy of that "Power", remove the "ForbidFlaw" tag, give it a new Unique ID, and then use the original power's ID in the "Replaces Thing Id" field so that it appears in place of it. Cool, that seems to have worked. Thanks!